Figure 1. Evening Doji Star pattern. 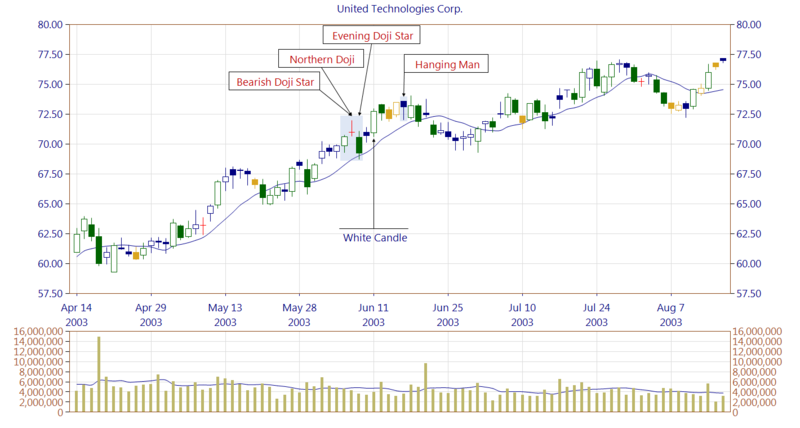 The Evening Doji Star is a bearish reversal pattern, being very similar to the Evening Star. The only difference is that the Evening Doji Star needs to have a doji candle (except the Four-Price Doji) on the second line. The doji candle (second line) should not be preceded by or followed by a price gap. If a lower shadow of a doji candle would be placed above the first and the second line shadow we would deal with the Bearish Abandoned Baby pattern. It happens that two first candles are forming the Bearish Doji Star pattern. The pattern, as every other candlestick pattern, should be confirmed on the next candles by breaking out of the support zone or a trendline. If the occurrence is confirmed, then its third line may act as a resistance area. It also happens, however, that the pattern is merely a short pause prior further price increases. The patterns is rather rarely occurring on the charts. Figure 2. 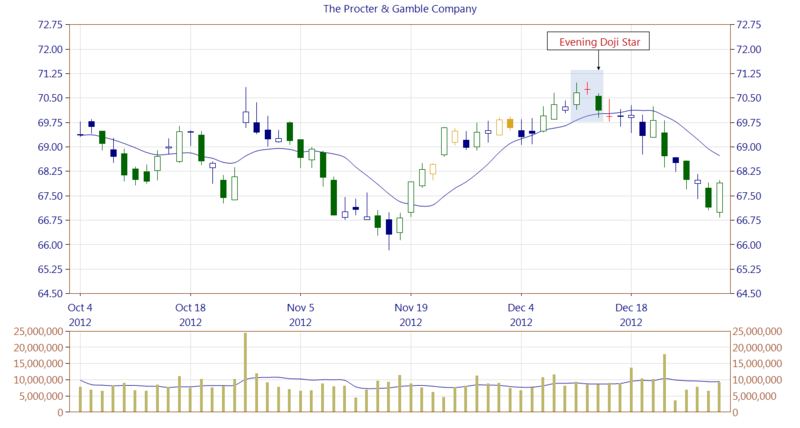 The Evening Doji Star is not a frequent pattern. On the chart, we can see that an Evening Doji Star is confirmed by a doji candle (red color), which body is placed below a trendline. In general every doji candle suggests indecision among traders at to the price direction. In this case, indecision lasted for 2 days, and then the bulls gained control of the stock. Figure 3. When on the chart patterns of the same forecast are closely located, it does not mean that the signal is stronger than in the case a pattern would appear alone. On the chart, we can see an illustration of this argument. A Bearish Doji Star and a Northern Doji are confirmed by an occurrence of Evening Doji Star. The problem for the bears is a low trading volume being below average. On top of that the third line of the Evening Doji Star closed above the trendline. A White Candle is formed, and the bulls are gaining control. Trading volume is still low however which indicates that the bulls are not so strong. Indeed, a Hanging Man appears, and the bears are in control of the stock for a few days. 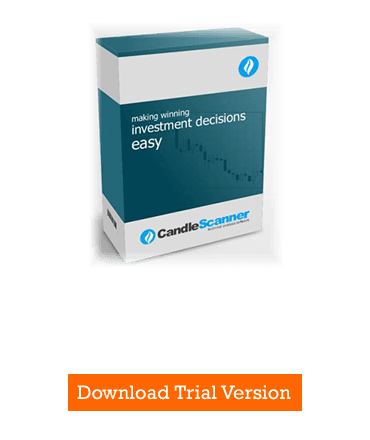 Below you can find some Evening Doji Star pattern statistics calculated by CandleScanner software.